Douglas Adams was a best selling author of the popular Science fiction/comedy radio/tv book series – The Hitch Hikers Guide to the Galaxy. 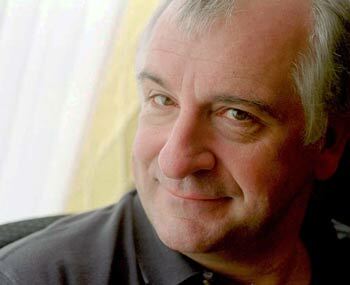 Douglas Adams was born in March 1952 in Cambridge, England. He attended Brentwood boarding school, where he excelled in creative writing and successfully gained a place to study English Literature at Cambridge University. At Cambridge, Douglas was more inspired to join the elect – Cambridge footlights than study English literature. The Cambridge Footlights was a leading group of young writers and comics. The group had provided the nucleus of the Monty Python team. Douglas eventually passed both his English degree and also became an established part of the Cambridge Footlights. After completing his degree, he gained one or two small parts in Monty Python episodes. However, he struggled to make enough money from his writing and TV appearances and so took a variety of odd jobs to supplement his income. Adams was a great fan of music. Admiring the music from Bach to Pink Floyd, Procul Harum and the Beatles. This music featured in his novels; he himself played the guitar and had a collection of 24 left handed guitars when he died. Outside of writing, Adams was noted for his staunch atheist beliefs. He described himself as a ‘radical atheist’ – so people wouldn’t ask if he was agnostic. He was friendly with scientist and critic of religion – Richard Dawkins. Dawkins dedicated one of his books – The God Delusion to Douglas Adams. Adams was also a committed environmentalist and animal activist. He took part in a charity trek which involved wearing a Rhino suit climbing up Mount Kilimanjaro. Adams was also noted for his enthusiasm for technology. He was an early user of the internet and email. It is also suggested he was the first person in Britain to buy an Apple Mac and remained a committed Mac user until his unfortunate death in 2001. Adams married Jane Belson in 1991. They had one daughter – Polly Jane Rocket Adams in 1994. Adams died of a heart attack on 11 May 2001, aged only 49. Posthumously his last book – The Salmon of Doubt was published in May 2002, carrying a range of essays from technology to religion.